In the business world, a good first impression is crucial. It primes how you’re seen and how you’re responded to. The reason why the first impression is so powerful is that the human brain judges information sequentially, according to Arthur Dobrin, a researcher in the science of first impressions. There is good news: Because first impressions are so important, there is a rich body of research on what verbal and non-verbal cues go into making a good first impression. While there are certain elements simply out of our control -- such as the faces we were born with -- there are five elements very much within our purview. To nail a good first impression, check out this short list of what to do. 1. Get your appearance right. Your physical appearance and how you dress impacts how people make snap judgments on your character and abilities. Studies by researchers in the United Kingdom and Turkey illustrate that clothing has a massive impact in how we are judged. For instance, in a study where subjects examined images of a man in an off-the-rack suit and the same man in a made-to-measure suit, subjects rated the made-to-measure version of the man significantly higher in confidence, success, flexibility and income than the off-the-rack version. Clothing matters, and while you may not be able to afford tailor-made or high end attire, you may be able to have the clothes you already possess tailored and hemmed so that they fit your frame and appear sharp. You can also ensure that you look clean, neat (tuck in your top and keep your hair styled and, if it applies to you, makeup simple) and are dressed appropriately for the work or social situation. Every occupation and office tends to have its own dress code, from Silicon Valley to publishing to finance, and there is no single way to dress for all occasions. It’s up to you to crack that dress code, and one simple way you can do so is through imitation. Look at the appearance of well-dressed employees and leaders in your field (who aren’t known for their eccentric dress flair) for cues. Are they wearing suit jackets or is it more of a vintage T-shirt kind of office? Also, it never hurts to be prepared for casual and dress scenarios: If you can, have some dress shoes, dress shirt or blouse and dress jacket at work, in case you have to dress up for an unexpected meeting, presentation or event. 2. Stand with good posture. Your posture and body language matter, largely because these nonverbal cues tap into people’s primal ability to judge whether someone is friend or foe -- or in today’s terms, a person’s “trustworthiness,” says Amy Cuddy, an expert on body language and author of Presence. Cuddy advises to carry yourself in a way that is “powerful and proud.” One way to do that is to slow down your breathing, pull your shoulders back and down, stand up tall and firmly plant your feet on the ground. “If you're carrying yourself in a way that's powerful and proud, you're saying to yourself, ‘I'm safe. I'm OK. I deserve to be here.’ And that is what comes across,” she says. Also, keep your shoulders square to the person you’re speaking with, so you appear as though you’re giving your full attention. When in doubt, you can always revert to the famous Woman Woman pose -- legs planted slightly apart and hands on your hips. The recipe for a good handshake is to make it firm, dry (you can apply antiperspirant to your hands) and last for about two or three seconds -- and accompany the handshake with good eye contact and a smile. Keep in mind, an overly aggressive “death grip” can be just as off putting as a limp handshake. Also, what we do with our hands when we talk or listen matters. People who gesticulate frequently tend to build trust quicker than those who don’t. One reason for this is that our hands are a highly visible cue for others to see our intentions, our sincerity and enhance our communications. However, there’s a sweet spot for gesticulation. Keep your hands below the collarbone. "Any higher and you're going to appear frantic," Alison Craig, image consultant and author of Hello Job! 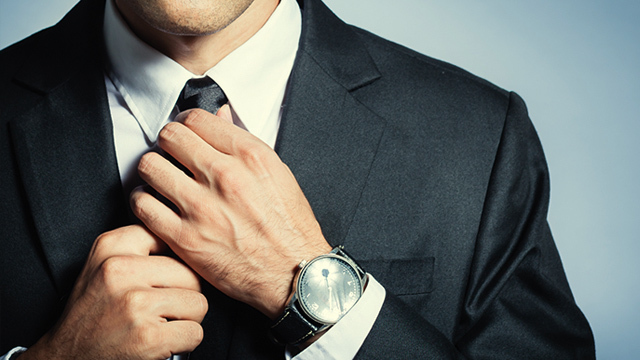 How to Psych Up, Suit Up, & Show Up, says. Also, keep your hands in an area that spans out 180 degrees from your navel. "Gesturing from here communicates that you're centered, controlled and calm -- and that you want to help," body language expert Mark Bowden says. Eye contact is meaningful. It can make you appear more honest, more memorable, more persuasive and establish a stronger connection with whomever you’re addressing. But too much of it can come off as confrontational or creepy. Too little, and you appear timid or as as though you have something to hide. The sweet spot is to look someone in the eye 60 to 70 percent of the time you’re interacting with them, according to communication and body language experts Barbara and Allan Pease. For those who find eye contact challenging, you can always try the old “look at the eyebrows or the space between the eyes” trick. That is, until you get more confident with eye contact. Also, be mindful of your blinking or rubbing your eyes when you first meet someone. When people are nervous, they tend to blink more than usual, body language expert Lillian Glasssays: “Your nerves are firing rapidly, your subconscious is working overtime and your eyes dry up to compensate.” Regardless of why, the effect can be off-putting. Because establishing your trustworthiness is the single most important part of creating a good first impression, your entire attitude -- how you behave and hold yourself -- needs to demonstrate trustworthiness. That means that when you’re talking to someone, stand (or sit) straight or lean in, but don’t lean back, and keep your hands out of your pockets. You want your body language to demonstrate that you’re comfortable and want to be there. While in conversation, let the person or people you’re talking to lead. You can establish trustworthiness by actively listening. People feel trust when they feel listened to and understood, according to Travis Bradberry, co-author of Emotional Intelligence. Make sure you have some active listening prompts (“I’d love to hear more about that”) and questions (“What is your biggest takeaway from that experience?”) to help the conversation along and show that you’reactively listening and not working off some generic script. As you listen, be mindful not to fidget, as in shaking your legs, tapping your fingers or checking your phone. All of these give the impression that you don’t want to be there. Last thing: smile. It is such an easy and graceful way to put someone else at ease, and there is little more off putting than having to talk to an unsmiling sour puss.